3 knitting patterns for baby socks I want to knit. 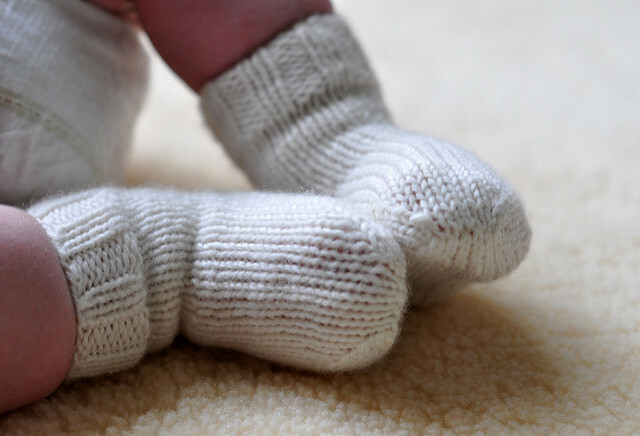 Loose socks or booties tend to come off when babies kick their legs. This one is designed to stay put. 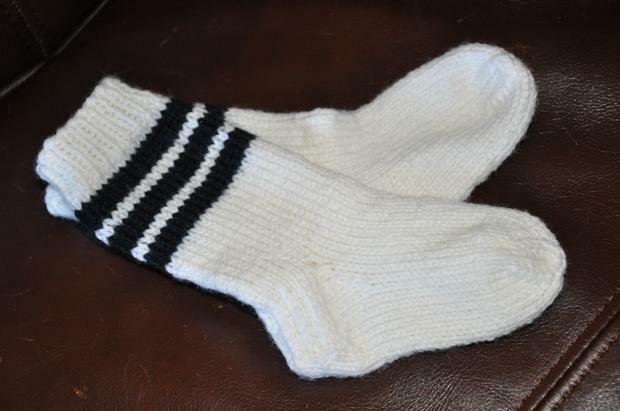 It is knitted from the ribbed cuff to the toe. The toe is closed by using the kitchener graft technique. 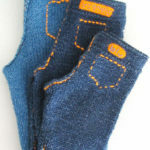 The pattern includes information about the gauge and accessories you will need. It is divided clearly into several sections focusing on each part of the construction: Cuff, Leg, Heel, Heel Flap, Gusset, Foot, and Toe. The hole in the toe is closed or grafted together using the kitchener graft stitch. The kitchener grafting technique presented here isn’t as well written as another one that I have come across. If you are new to kitchener grafting, I highly recommend learning it from TECHknitter at http://techknitting.blogspot.sg/2007/05/easier-way-to-kitchener-stitch-also.html. The yarn used in this pattern is Red Heart Baby Econo. Unfortunately, it has been discontinued by Red Heart. For suggested substitutes, you can use Yarnsub.com or look for worsted weight, plied, 100% acrylic wool. Pattern: Happy toes baby socks. This is a sporty looking knee-high socks. It is knitted cuff down in the round. The instructions for the gusset is specific and clearly laid out. The toes are closed up using the kitchener graft stitch and the instructions to do that is given. Designed by Patti Pierce Stone. The pattern is free but it is for charity or personal use only. Neither the pattern now the socks made from it, are to be sold. Sizes from pre-emies to toddlers. The instructions include both toe-up and top-down. If you like this list, you might also like my knitted baby mittens list.